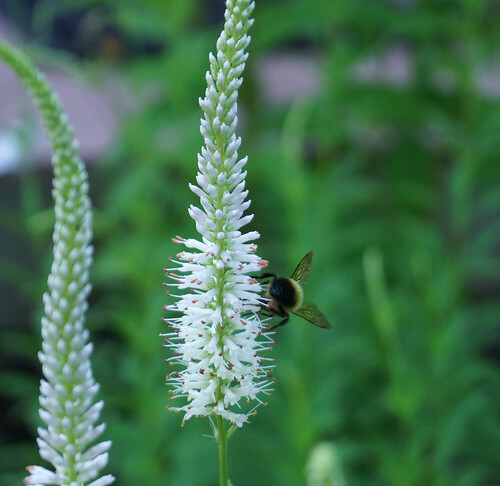 Perhaps my favorite plant in my yard is Culver's Root (Veronicastrum virginicum). I'm not sure why I have such an affinity for this particular plant ... but I do. I picked up 4 of them at Garden of the Woods last summer; they didn't do much last summer as they were getting settled in, but this year they have come in really nice. They stand up straight and tall in the back of the garden bed I have them in, their simple and attractive green leaves giving a pleasant clothing to their tall stems. The highlight though is when they start to bloom. 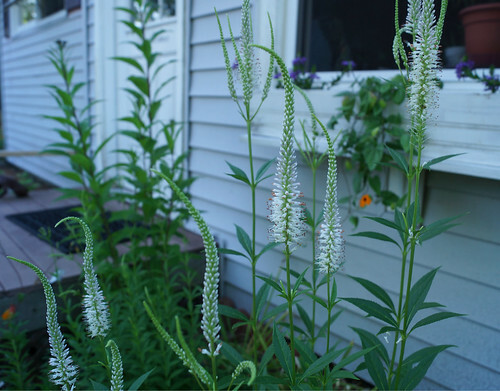 They have 6 - 9 inch tall spikes filled with tiny white flowers. Their spikes have been heavy with buds and a few of the flowers have recently started to emerge. When I came home from work tonight, the bottom halves of most of the spikes were completely bloomed out and, much to my delight, some of the local bumble bees had discovered them! I stood out in my yard for about 10 minutes just watching the bees buzz around and forth of my Culver's Root. What a great way to end the day.